One of the UK’s largest vertically integrated baking and flour milling businesses with over five bakeries in the UK. The bakeries were undergoing reinvestment of which a key requirement was to improve operational performance through better control, reporting and visibility of; scheduling, recipe control, product tracking, set points, adherence to plan, yield, waste and water absorption. The new SCADA system needed to be robust and require minimal levels of maintenance to ensure a low cost of ownership. The existing project management information system (PMIS) that was used across a number of sites to offer basic SCADA functionality required a complete overhaul, the existing system was over 30 years old. Following a review of suppliers, OAL was chosen to replace the old SCADA system and implement their proven bakery product tracking system because of our bakery controls experience. As part of the enabling works, the bakeries installed a Modicon PLC on each plant. This plc is used to capture data from the various areas of the plant and store in a central location. OAL’s SCADA system uses these as the primary source to capture data and control hardware on the plant. In addition data is exchanged directly with packaging lines via CompactLogix PLC’s and directly with Mixers via existing Modicon PLC’s. Legacy devices are connected to the new Ethernet infrastructure. This gives the bakery the opportunity to continue upgrading the rest of their equipment to Ethernet devices in the future, whilst maintaining communication with existing equipment. The new system enables paperless recording and reporting of ingredient usage, plant utilisation, waste and yield whilst also providing maintenance/engineering functionality. Significantly the system utilises the newly designed reporting software to improve engagement and visibility of plant data. The new screens pictured look very different to the old screens and uses clever traffic light systems to highlight intolerance's. The new screens provide a much greater resolution in tracking, and as such it is much easier to view what is going through the plant at a glance. This is due to the re-design of the screens and the use of colour whilst still remaining familiar with the old system. 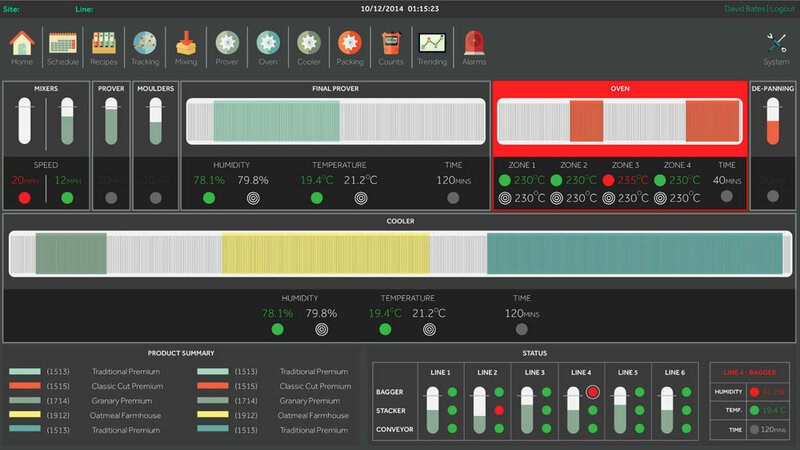 The OAL solution has utilised a virtualised SCADA system over the more traditionally server installed systems seen in food manufacturers. A key benefit of virtualisation is the ability to reduce downtime because of the real time backup of data. Furthermore virtualised systems require less maintenance and have a lower cost of ownership. Combining the virtualised SCADA with Terminal Services based clients results in an extremely robust infrastructure. Terminal services based Thin clients reside predominantly on the back of the plant monitors. They provide a remote desktop connection onto the SCADA. The main advantage of this is that a client is not tied to one location, and are interchangeable. If a client breaks it can be simply removed and replaced with a spare. Another advantage is a saving in cost, not only in hardware, but in software as well. Due to the SCADA software being server side, licensing costs are reduced. In traditional SCADA architecture, each machine would need a software license. With the new client architecture a license is needed for each server (2 in this case), and then special ‘client’ licenses for each thin client. The thin client licenses are significantly cheaper than standard licenses, reducing cost. ● Reduction in yield losses due to enhanced visibility of the process parameters. ● Reduced raw material usage across sites. ● Increase capacity because of improved scheduling.